Currently, I am reading Neil Gaiman’s The Sandman, a series of graphic novels by the author of American Gods, Coraline, and Stardust, the last two of which were made into movies. If you’ve seen his films, you really get an idea as to the author’s mind—he’s the kind of writer bursting with creativity and who has a very unusual (and sometimes disturbing) perspective on the world. If there is one author today I would call a successor to Lovecraft, much as I loathe to make comparisons between writers, it’s this guy. I don’t usually review graphic novels as I feel they are outside my area of knowledge, but if there are a couple of series that really elevate the medium, one would have to be Alan Moore’s Watchmen and the other Neil Gaiman’s The Sandman. The Sandman is the god of dreams. One hundred years ago, he was imprisoned by a cult, and by the time he got out the whole world had gone to hell. Last night I was reading about a serial killer convention. It was so disturbing I almost had to put the book down. But the author justifies all that comes before in the conclusion. Gaiman does not glorify gore (which I detest) but he is not afraid to show us the darkest side of humanity. In the end, it turns out that serial killers in general have been largely influenced by a nightmare that got loose from the dream world. Instead of punishing or killing the serial killers, the Sandman simply forces them to realize the awfulness within themselves. 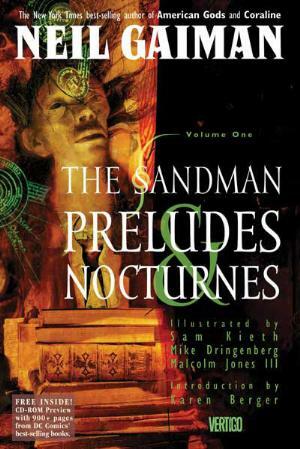 It’s very dark, mature and complex, but for those who can stomach it—and those old enough not to take the wrong message from it—I can’t recommend The Sandman enough.